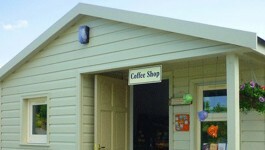 After you’ve explored the castle ruins, and stopped for a snack in the Riverside Coffee Shop, there’s much more for you to explore when you set off from the castle gates. [singlepic id=8 w=300 h=225 float=right]Two loop walks begin at Carriganass. The Póc an Tarbh route takes about 3 hours, while the Srón na Gaoithe walk takes about 3.5 hours to complete. Organised walks often set out from the castle, and are advertised on our news and events page. 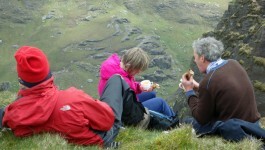 The Pilgrim’s Way route offers you a 5-6 hour walk from Carriganass Castle to the church on the lake at Gougane Barra. 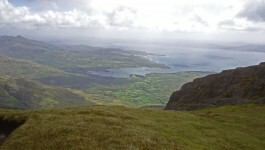 Carriganass is a landmark on two of Ireland’s major walking routes: the Sheep’s Head Way, and the Beara-Breifne Way. We’re also within driving distance of Hungry Hill, the peak which dominates the skyline as you head out along the coast of the Beara peninsula. The three valleys that surround Carriganass are perfect for cycling, and the Sheep’s Head cycling route is close by. 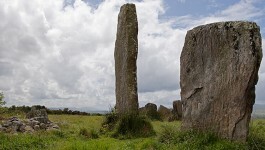 If you’re interested in a historical tour, then take time to visit Kealkill’s stone circle, an amazing monument from the megalithic era. The route to it is marked from the main road above the castle. Meanwhile, it’s only a short drive from here to Gougane Barra, the beautiful retreat from which St Finbarr set out on his mission to convert Cork to Christianity. In fact, it is possible to walk to Gougane Barra from Carriganass using The Pilgrim’s Way, a recently-opened section of the Beara-Breifne Way. 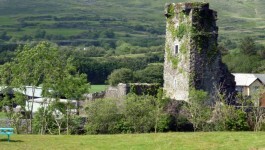 The castle is just 15km from Bantry, which is the home to the best preserved of Ireland’s remaining ‘big houses’. The building and gardens at Bantry House are impressive in their own right, but – like Carriganass Castle – the House can also claim to have formed the backdrop to a key moment in Ireland’s history when, in 1796, Theobald Wolfe Tone and the United Irishmen were forced by bad weather to abandon their attempt to land their armada in Bantry Bay. An account of their attempt, and the remains of one of their ships can be seen at Bantry House’s Armada Centre.